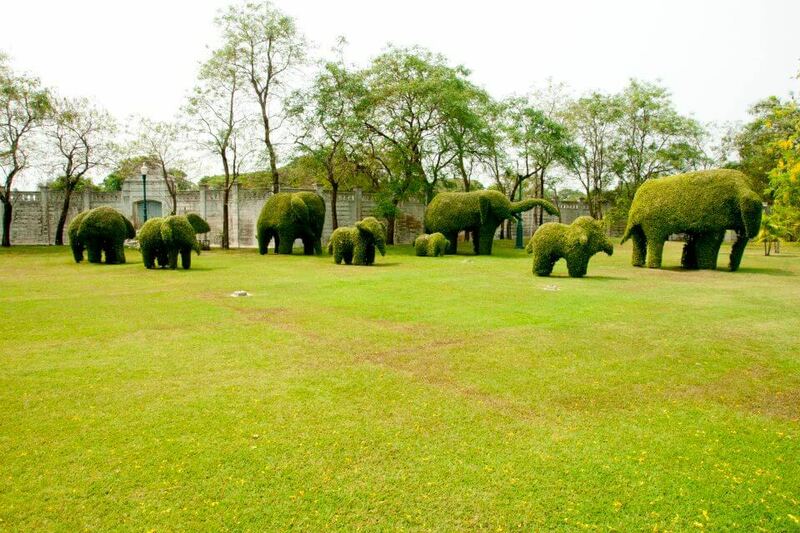 I would like to introduce you another nice destination to visit near Bangkok, Ayutthaya. I have been to Ayuttaya several times, and I never get bored of it. On a very recent day-trip to Ayutthaya, I visited Bang Pa-In Palace, located in Bang Pa-In District, about 20 kilometers away from the city of Ayutthaya. I took a train from Hua Lam Pong station. The train tickets were free! (For Thai people only) It took me just over an hour to arrive at Bang Pa-In station. Then I took a Tuk-Tuk from in front of the station, it took only 10 minutes to the palace. The Tuk Tuk driver asked only 20 Baht per passenger. Bang Pa In train station, with the old royal waiting room in the background. The palace dates back to the seventeenth 17th century, although it did fall into disuse for a long period. 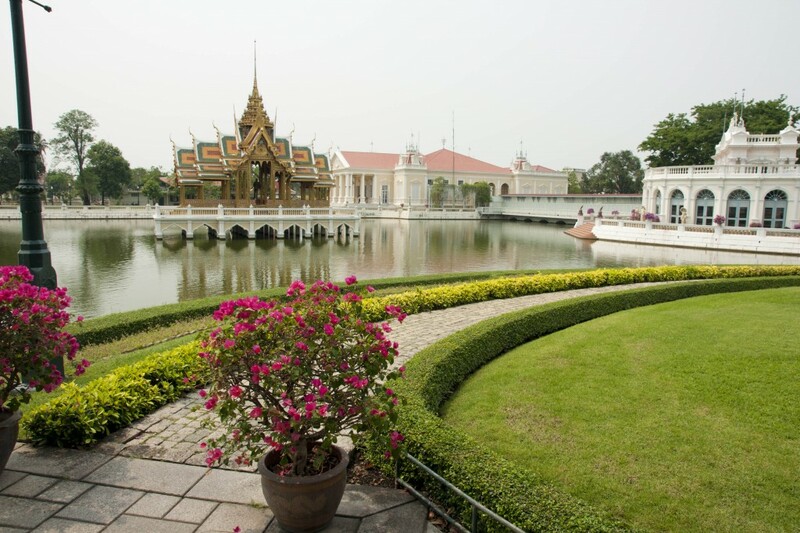 The palace was revived by King Mongkut (Rama IV) in the nineteenth century. Today, the palace is only used infrequently by Their Majesties King Bhumibol Adulyadej (Rama IX) and Queen Sirikit for holding receptions and banquets. The palace is very European in design. The buildings are laid out along an artificial ornamental pond. In what was formerly the public area of the palace, the lake is a long rectangular pool, lines with formal plantings and the odd folly. The compound is divided into two sections, the Outer and the Inner palace. The Outer consists of buildings for public and ceremonial uses. The Inner Palace was reserved for the King ans his immediate family. พระที่นั่งไอศวรรย์ทิพยอาสน์ Aisawan-dhipaya-asana Pavilion (The Divine Seat of Personal Freedom) It is located in the middle of a pond on the palace grounds. พระที่นั่งเวหารจำรูญ Pra Tinang (Royal Residence) Wehart Chamrun (Heavenly light) was built in Chinese architecture and took 10 years to build. It was completed in 1889. 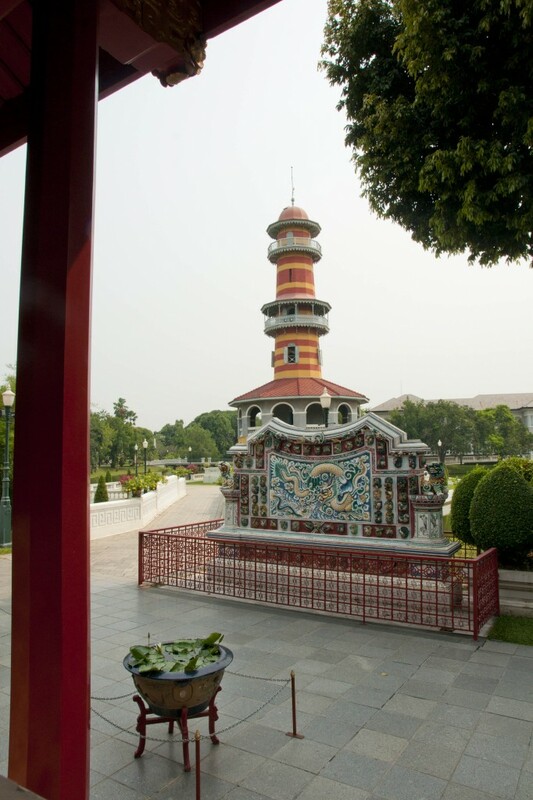 หอวิฑูรทัศนา Ho (Tower) Withun Thasana (The sages look out) is a large colonial-style building located behind Wehart Chamrun Residential Hall. The observatory was built by King Chulalongkorn in 1881 as a lookout tower for viewing the surrounding countryside. 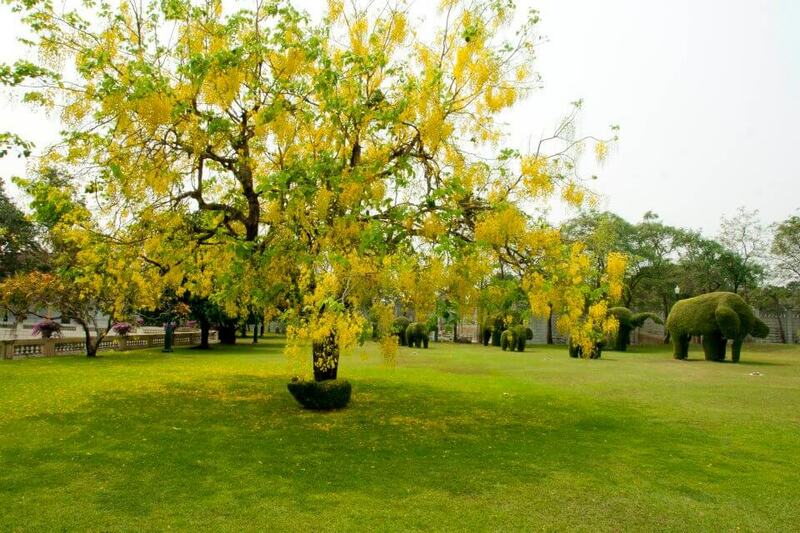 พระที่นั่งอุทยานภูมิเสถียร Uthayan Phumisatian Residential Hall (Garden of the Secured Land) was the favourite residence of King Chulalomgkorn when he stayed at Bang Pa-In Palace. Built in 1877 of wood in style of a two-storey Swiss chalet. The coolest and most comfortable way to get to Bang Pa In is via one of the many luxury cruises available from riverside hotels. The Chaophraya River Express Boat service also operates a special service on Sundays from the Prachan pier. 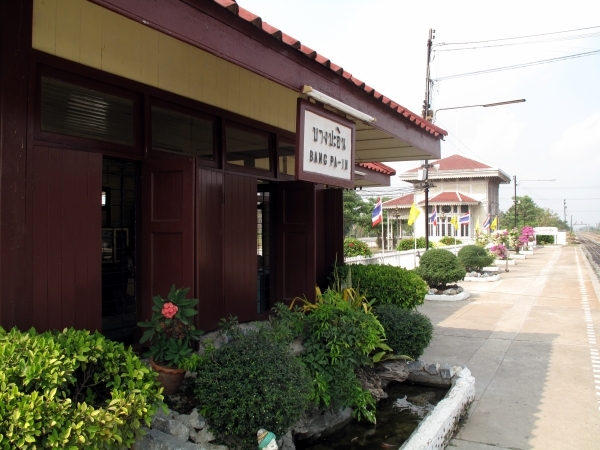 You can also reach Bang Pa In by train from Hualampong station like I did. There is a fee of 100 Baht (3.34 USD) to enter the palace grounds. Hours are from 8:30 am to 5:00 pm, but the ticket office closes at 3:30 pm. Also note that a similar dress code is applied as you visit temples. 2. See-through shirts and blouses, as well as culotters or quarter length trousers can not be worn. 4. Sandles (without ankle or heel straps) can not be worn. 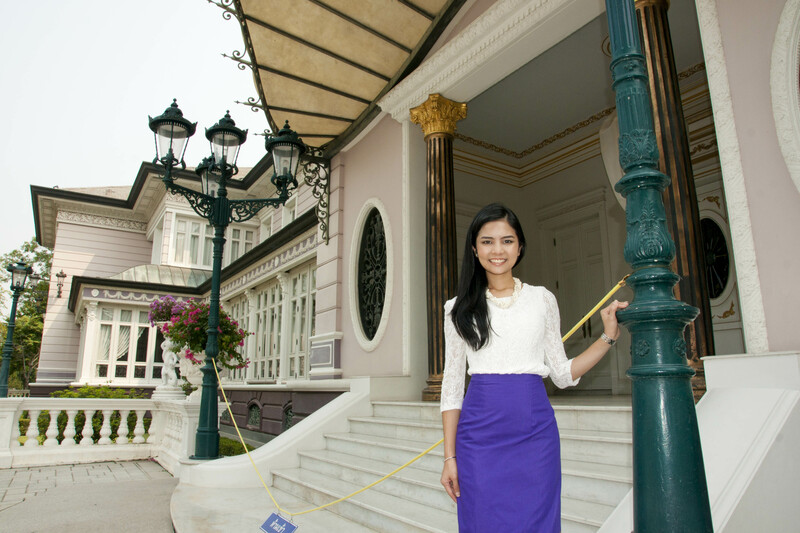 I would like to visit Bang Pa Inn Royal Palace again. I read that I can take a train from Hualampong Station and then take a yuk yuk to the Royal Palace. How do I get from the Royal Palace back to the Bang Pa Inn Train Station and how much. Sawatdii ka San apologies for my late response. You can catch a Songthaew ( a two bench seats truck) but I don’t know about the fare, it should cost about 30 Baht. I’m a mixed Thai, and I’m visiting Thailand in a week’s time. 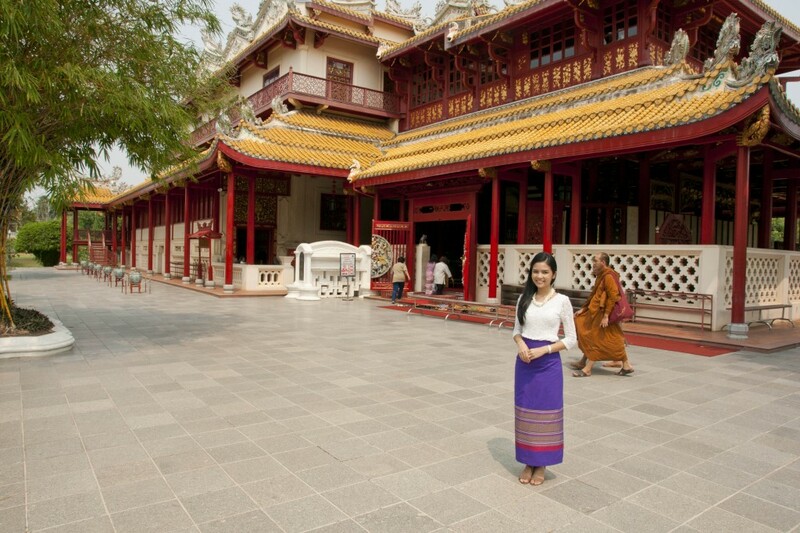 I would like to know if we can buy sarong at the Palace should the tourists wear short skirts/pants when they visit the Palace? Your purple sarong is very pretty ka! LOVE IT! We plan to visit temples of Ayutthaya and then head to Bang Pa In after. Is there a van that we can ride in Bang Pa In going back to Bangkok? We don’t want to go back to Chao Phrom Market or something for the buses going to Bangkok. Does the Hualumpong train to Bang Pa in station operate every hour? Or do we need to be at Hualumpong train station by 7am to catch the train to Bang Pa-in station? Are there succeeding trips after 7am? Hi Mod, I was wondering if you know of any places to stay in Bang Pa-In? I enjoy small towns in Thailand as a nice get away from the big city of Bangkok. But I’m not having much luck finding out about what is in Bang Pa-In. We did enjoy the trip! We got there by cable car. What a memorable ride! We went back to Bangkok by van (THB 50 per person) to Morchit in about 70 minutes and took a taxi from the station to have dinner at Somboon Surawong branch! Delicious seafood! Highly recommended! I am on the train to Bang Pa In. The train was supposed to leave at 9.25 but about 35 minutes delayed :(. Hopefully the summer palace is worth a visit. Hi Mod, My wife and I have been to Bang Pa in. We loved it there.